Coordination for Kids A child's physical coordination will ultimately have a bearing on his skill level in sports, academic performance and even attitudes about school and education, found a report by Lori A. Smith, president of the Illinois Association for Health, Physical Education, Recreation and Dance. That's why it is important for kids to have structured games and activities throughout the day that present coordination exercises. With your help, your child can work on developing coordination skills that can help him throughout his life. According to Greg Silva a 7th degree black belt in Kenpo Karate and author of the book "The Silva Solution" Teaching Black Belts From The Inside Out", "martial arts in like no other sport in developing coordination." Coordination is developed thought physical exercises that access both hemispheres of the brain. As kids begin martial arts we often notice kids with good physical skills when doing things on their favorite side. However in martial arts we practice things both sides and often from side to side at pretty fast repetitions. With younger kids we often see difficulty with the coordination from side to side. When students punch with their right hand they are accessing the left side of the brain. When doing a left punch they access the right hemisphere of the brain. When first starting out it seems that there isn't a clear pathway for many students especially younger ones. Mr. Silva explains it like this. "If you and a neighbor had a large hedge between your properties it would be difficult to pass from one yard to the next. However if you and your neighbor would visit often, a clear path would soon form." This same thing happens when kids train in martial arts. The drills, basics and exercises in martial arts form clear pathways of communication and the skills and coordination develop rather quickly. We see kids improve on all areas including quick thinking and decision making. These along with improvement in physical activities improve confidence as well as self esteem. Parents concerned about motor skills and coordination might want to consider martial arts for their kids. There are very few sports that build coordination inherently. Football and baseball have drills for building motor skills however martial arts has the drills built into all of it's activities. A child's physical coordination will ultimately have a bearing on his skill level in sports, academic performance and even attitudes about school and education, found a report by Lori A. Smith, president of the Illinois Association for Health, Physical Education, Recreation and Dance. That's why it is important for kids to have structured games and activities throughout the day that present coordination exercises. With your help, your child can work on developing coordination skills that can help him throughout his life. According to Greg Silva a 7th degree black belt in Kenpo Karate and author of the book "The Silva Solution" Teaching Black Belts From The Inside Out", "martial arts in like no other sport in developing coordination." Coordination is developed thought physical exercises that access both hemispheres of the brain. 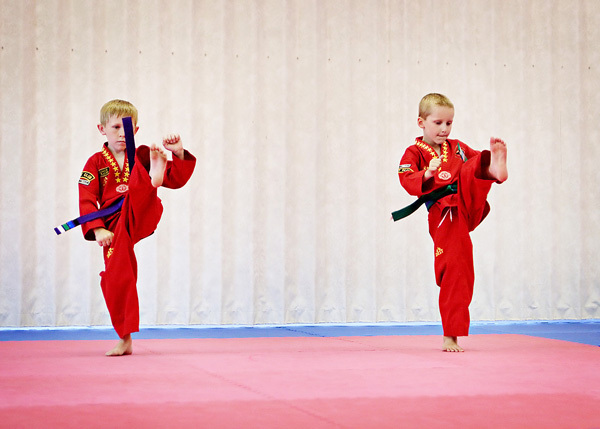 As kids begin martial arts we often notice kids with good physical skills when doing things on their favorite side. However in martial arts we practice things both sides and often from side to side at pretty fast repetitions. With younger kids we often see difficulty with the coordination from side to side. When students punch with their right hand they are accessing the left side of the brain. When doing a left punch they access the right hemisphere of the brain. When first starting out it seems that there isn't a clear pathway for many students especially younger ones. Mr. Silva explains it like this. "If you and a neighbor had a large hedge between your properties it would be difficult to pass from one yard to the next. However if you and your neighbor would visit often, a clear path would soon form." This same thing happens when kids train in martial arts. The drills, basics and exercises in martial arts form clear pathways of communication and the skills and coordination develop rather quickly. We see kids improve on all areas including quick thinking and decision making. These along with improvement in physical activities improve confidence as well as self esteem. Parents concerned about motor skills and coordination might want to consider martial arts for their kids. There are very few sports that build coordination inherently. Football and baseball have drills for building motor skills however martial arts has the drills built into all of it's activities.